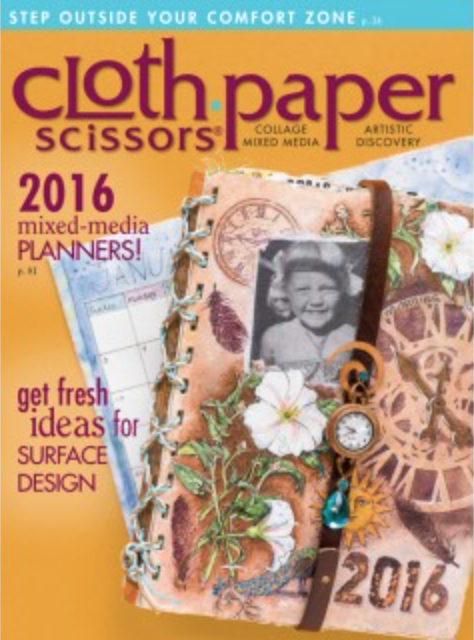 My column The Creative Pulse in the January/February issue of Cloth Paper Scissors is all about the benefits of stepping outside your comfort zone. -Crack open a supply that you've never used. -Take a class in a technique that's outside your wheelhouse. -Work on a collaborative project with other artists. -Add another layer to a piece you are satisfied with but know could be better. -Usually use a paintbrush? Use your hands instead. I'd add- Take twice as long to do something! great tips, Seth! 'CONGRATS...I have the magazine, and I just shared your ideas with my students! Thanks for your inspiration, Seth! It's always fun + exciting to read your suggestions! Well done, Seth! Will be picking up this issue ASAP! Great tips for keeping things fresh! Here is what a wise woman(Orly) had me do. First take a journal spread, save the one spot you HATE. On the very same spread create a spread you like from that. Then, take a section you like from the spread, and on the same spread create a new spread. Do that over and over 7 times. You defiantly learn a lot from that exercise. Love these simple and inspiring ideas.